There is so much written about this mega tourist destination in the Adriatic and yet I found the planning stages difficult. Initially it was a case of the best place to stay in Dubrovnik, which led to should we stay within the walls of Dubrovnik and finally what to do in Dubrovnik and would the crowds spoil the experience? I don’t enjoy crowded destinations and vacillated over whether to visit Dubrovnik at all. It was toward the end of Ten Weeks in Europe when Marty decided for me. We were going to visit Dubrovnik and I am so pleased that we did. Go Crazy with a camera. Late afternoon is a great time for photographs. 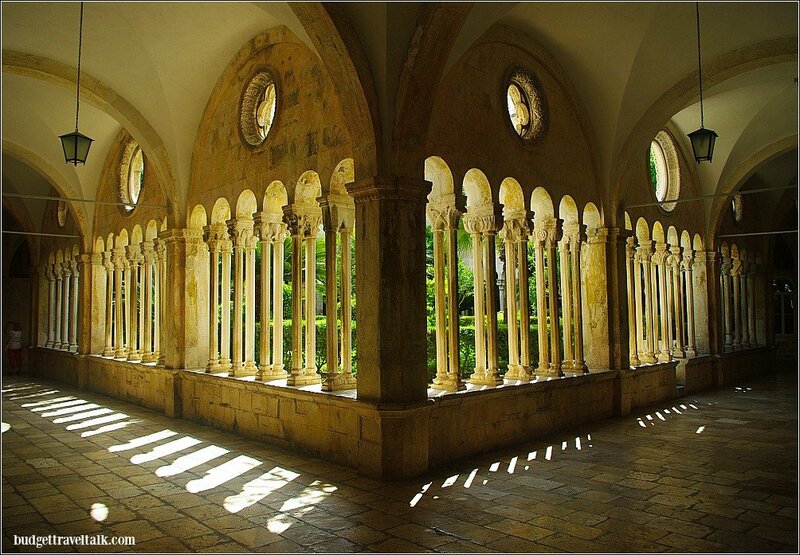 Drool over the Franciscan Monastery Cloister Dubrovnik. Look inside the Church of St. Ignatius of Loyola. 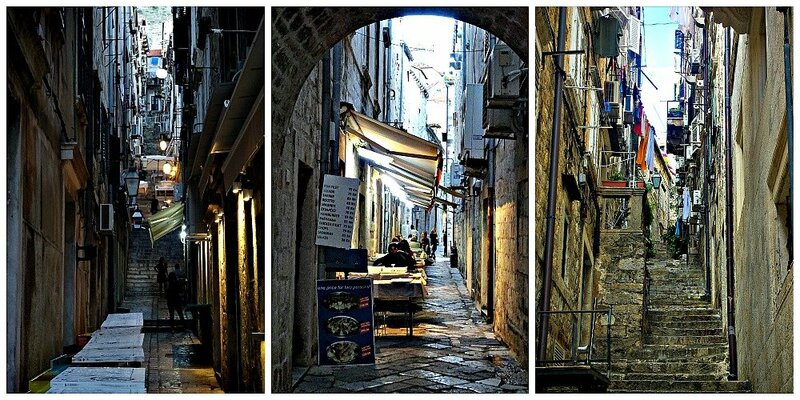 Get lost in the lanes of Dubrovnik Old Town. Walk the Walls of Dubrovnik. Mt. Srd – Dubrovnik’s mountain backdrop. Book Early to Stay in Dubrovnik old town. 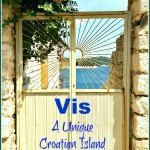 Best Place to Stay in Dubrovnik – outside of the walls of Dubrovnik. 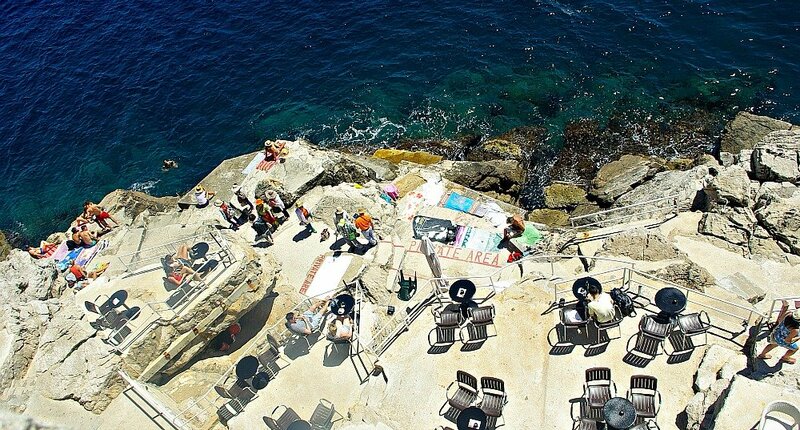 Dubrovnik’s Gruz area has great budget accommodation options. Where to Stay in Gruz. Banje Beach is close to town. 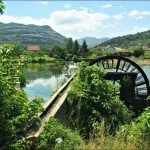 Will I need a vehicle in Dubrovnik? There is no vehicular access into the old city. Dubrovnik Accommodation outside the walls. Book early to get the best accommodation. Swimming and Drinking at the Buza Cliff Bars. Arriving in Dubrovnik by Car. Arriving in Dubrovnik by Ferry. I am so happy that we visited Dubrovnik in June, the last month of Spring in Europe. I would think twice about visiting in summer (July/August). In Spring the polished limestone blocks of the Stradun shine in the afternoon sun and by lamp light at dusk, unimpeded by a thousand human feet. The weather is warm and flocks of tiny birds circle overhead, kayaks are afloat and people are swimming off the Buza Bars. Spring weather is perfect for open air dining, romantic music floats on the breeze and an uphill walk home is enjoyable. September to November is when locals feel they own their town again but it is also a great time for visiting Dubrovnik. The Stradun is once again walkable (minus crowds and radiating heat), it is pleasant to climb Mt. Srd for views of the city and the cable car queue is 50% less, Banje Beach is once again a desirable place to be (during summer the best beaches near Dubrovnik are Lapad and Babin Kuk) and you are more likely to get a seat on a bus, enjoy the air-conditioning and the view. Spring and Autumn as the best times to visit Dubrovnik. Dubrovnik’s Old Town is surrounded by water on three sides and is quite compact. The Stradun where the marker is on the map below, is the main street. Click the plus sign to see it clearly. Click the minus sign to see the Buza bar at the bottom of the map. Dubrovnik, alias Kings Landing, had superstar status eons before the Game of Thrones (GOT) Television series was released, but after 8 spectacularly successful seasons, Dubrovnik’s popularity has skyrocketed. It is possible to tick the sights off by yourself or you can take a tour. A tour saves time as the local guide knows all the places, plus you are keeping company with other GOT fans. There are many, many GOT tours available and after careful comparisons I suggest the following three Game of Thrones Tour options. This Get your Guide Tour has great reviews, only takes 2 hours, is led by a huge GOT fan and is the most affordable. This Get Your Guide Tour is more comprehensive. The tour finishes on the island and you can choose to stay for the rest of the day or return to the mainland. This Viator Tour is inclusive of entry fees to the Walls and Fort. Can be upgraded to 5.5 hour tour which is inclusive of the Arboretum entry fee. Viator release local guide details on confirmation of booking. Rates 5 stars out of 621 Viator reviews for this tour. Can upgrade to include Trsteno Arboretum – the palace gardens in the third series. This includes a mini bus ride and turns it into a 5.5 hour tour. Tour available in French if 2 or more persons book. The 300 m long main street, the Stradun is one of the most evocative streets in Europe, if you can see it minus the masses. Save your efforts until after 4 pm when the light is great and the Cruise passengers dissipated. June is not quite as busy as July and August and the Stradun is a delightful place to be in the hours before and after dusk. Romantic music drifts down the lamplit street and everyone arrives to enjoy the ambience. All that stone radiates heat so a cool drink at a shaded table for a spot of people watching is totally in order. Can you imagine yourself here. 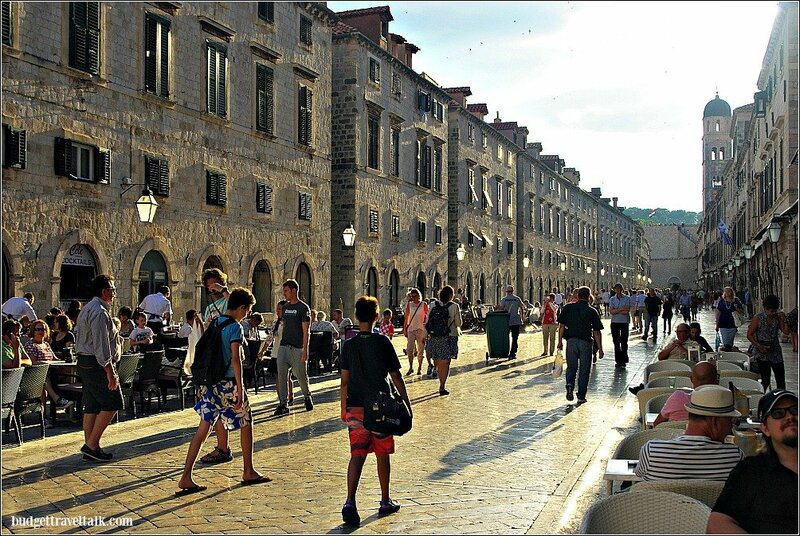 Remember that the Stradun is the main street of Dubrovnik old town. After it’s been walked and photographed, start exploring the cross-roads and back alleys. I am strangely addicted to Cloisters and couldn’t wait to visit those at the Franciscan Monastery in old Dubrovnik – it’s right on the Stradun. I wasn’t disappointed and although there is a 30 kuna charge, it’s one of the best cheap things to do in Dubrovnik. It is delightfully quiet and the perfect escape from the sometimes craziness outside. The attached church is free to enter. Quirky Fact – The monastery holds one of the oldest pharmacies in Europe – believed to be the third oldest. Built in 1317, it serviced the monastery’s friars. Croatians do love their pharmacies! This fort that thwarted the Venetians, doubles as a theatre and during Dubrovnik’s Summer Festival (10th July to 25th August), holds performances such as the famed “Dubrovnik Performance” of Hamlet. But it can otherwise be visited from 8 am and is a good place to watch the kayaking tours 37 metres below and soak up those Adriatic views. 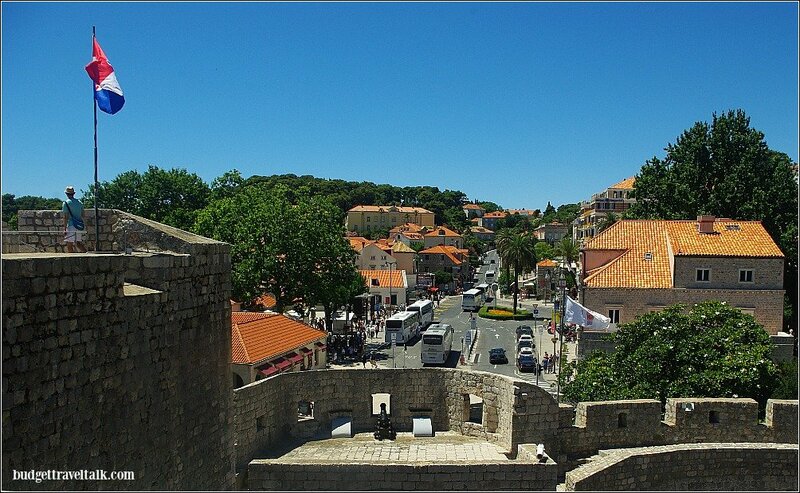 You will find it just outside the walls of Dubrovnik at Pile Gate and entrance is included in the city wall ticket. There is a steep incline and steps before the entrance. Inside is a courtyard with steps to the Ramparts. Public Toilet on site. Book your Kayaking Tour with Get Your Guide. Walk up the Jesuit Steps – those monumental baroque stairs featured in the Game of Thrones – and take a look inside at the Baroque frescoes retelling stories of the Saint’s life. Exploring the lanes that climb steeply from the Stradun toward the top end of the old town, is a delightful way to see hidden sights. This part of town is full of atmosphere, with tiny open air restaurants and quirkier souvenir shops. Get lost in the lanes – it’s free, safe and one of the fun things to do in Dubrovnik. It’s a popular thing to do. In August 2016 a record breaking 10,388 people paid to walk the walls, bringing on measures to restrict the amount of people entering Dubrovnik each day. I believe this is achieved by reducing the amount of cruise ships. So far there have been no measures like turnstiles etc. although there is CCTV. But don’t let this detract from your wall experience. They offer a totally different perspective of the city. I suggest first thing in the morning or late in the afternoon as the best times, both to avoid heat stroke in summer and boat crowds who arrive at about 10 am and leave at 4 pm. Take the chairlift or climb to Mt. Srd and the Homeland War Museum. It has some interesting displays and actual footage from the War, playing on loop. I’m not that into Museums or War memorabilia but sat transfixed watching the black and white footage. The other displays are succinct. The Museum building itself is an igloo shaped brick structure with atmospheric moss growing on the ceiling. Climb on to the roof of the Museum – It is a fantastic place for sunset photos. It can be cold up there so go prepared. 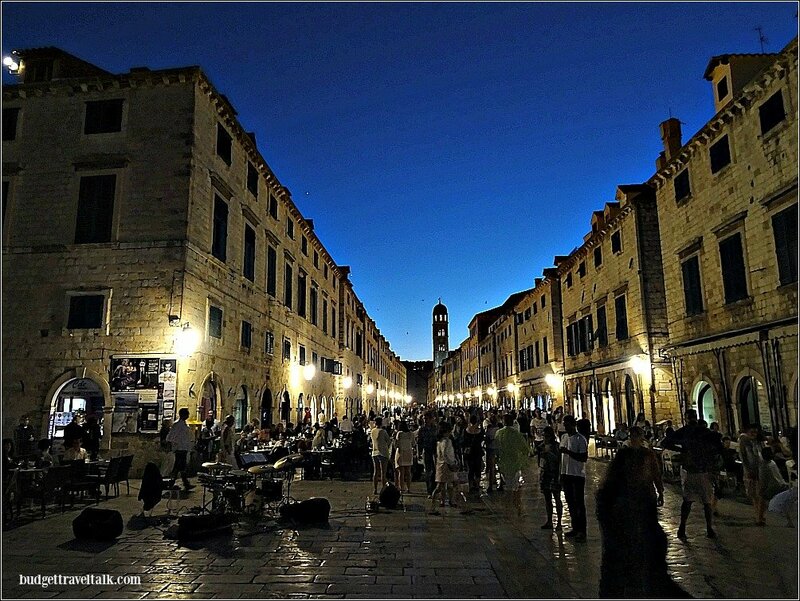 Most tourists consider the best place to stay in Dubrovnik is within the walls of Dubrovnik in Dubrovnik old town. If you can’t resist staying in this 16th Century UNESCO protected old stone town – regardless of the season and crowds – I say book early and go for it. Dubrovnik old town was under siege for 7 months during the 1991 war, with 56% of it’s buildings damaged and deserves kudos for it’s beautifully restored classic buildings and romantic atmosphere. By booking early I mean 4 to 6 months before arrival. We’d ear-marked some Airbnb places within the walls of Dubrovnik, but seven weeks prior to arrival (at the end of June) they were no longer available. 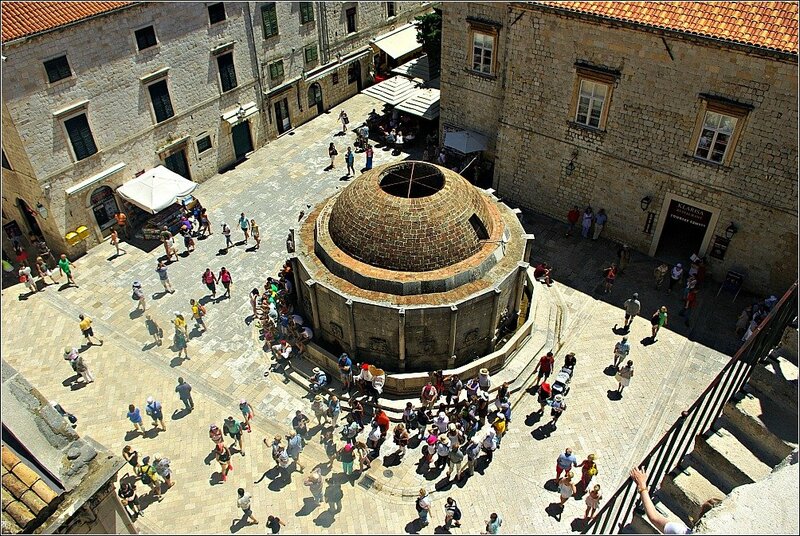 July and August are peak season in Dubrovnik, so it follows that late June is popular as well. They are recommended as Value for Money 9.1. Location 9.6 – Within the Walls but with a lot of stairs down to the Stradun. When booking ask which gate is the best to enter through. I can’t emphasise enough the need to book as early as possible. A fellow blogger recommending Anica Guesthouse, a small place in the Gruz area. There was one last room available on booking.com and we grabbed it. As well as containing Dubrovnik’s modern port area, Gruz is a popular residential area. Read more about the different areas of Dubrovnik HERE. Anica Guesthouse in the Gruz neighbourhood outside of Dubrovnik’s walled City where most locals live. Sitting on the cushioned bench beneath Anica’s olive tree was delightful. 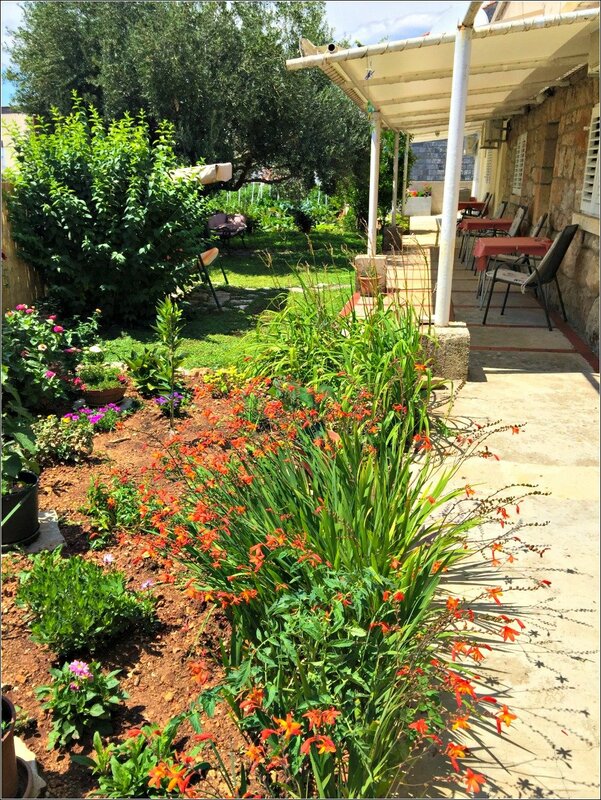 Anica’s owner was a friendly woman, the apartment small and modern and the garden WOW. The only downer was very patchy Wifi. Dubrovnik is a hilly place and Anica guesthouse is midway on a hill and although it doesn’t have ocean views, a cool breeze made it’s way to our terrace table for two. At first I was concerned by our limited accommodation choices, but we actually enjoyed staying in Gruz and would choose to stay there again. If we’d found a place in the old city, we probably wouldn’t have ventured into greater Dubrovnik to experience this vibrant community. Our daily walk to the old city was interesting and fuelled our anticipation. It was a 25 minutes down-hill saunter to Pile, the neighbourhood which gave it’s name to the eastern gate, and an enjoyable No. 8 bus ride on the (uphill) way home. Here is a link to the bus schedule. The Gruz No. 8 came along at 20 minute intervals. Planet D and Andrea Pisac from Zagreb Honestly blog say this about the Gruz area. How to get from Anica Guesthouse in Gruz, to the old town. Views of the walled town on our walk from Gruz neighbourhood. Ploce (behind the Grad or town) is considered THE best location to stay in Dubrovnik outside of the walls. We’ve been there and it is gorgeous but I’d add two things. As the walls of the old town are left behind, the land steepens – Ploce’s ocean and old town views are reflected in it’s prices. Parking in Ploce is limited to a few street spots. Parking would most likely need to be in the underground carpark on Zagrebacka (Street) or in Gruz. If staying in a Ploce Hotel enquire if they have dedicated parking. In fact it is just beyond the Ploce Gate of the old town, with views back to the town and across to Lokrum Island (visit on a day trip). The car parking situation is the same as Ploce. Banje Beach is one of the best beaches in Dubrovnik and the closest to the old town. This view is of the walled town is from the Banje Beach, City Port and Ploce Gate side of town. As the walled city is a vehicle free zone it is necessary to manoeuvre our luggage over the cobblestoned streets and quite possibly uphill in order to reach the gates. Normally this would not deter us, but we prefer our early morning starts, especially those with an international flight involved, to be as simple as possible. At Anica Guesthouse there were a (mere) 65 steps down to street level where our pre-booked 6 a.m. airport taxi awaited. It was quite easy to do. Looking down from those famous walls to the (large) Onofrio Fountain built in 1438. The bus service runs every 10 to 30 minutes, is affordable and far less stressful than driving. If you feel the need to leave the city, why not rent a vehicle for the day or take a tour. 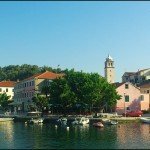 The best day trips from Dubrovnik are to Ston on the Peljesac Peninsular where the famous oysters are grown, Kotor in Montenegro and the beautiful Trebinje in Bosnia. We dropped our rental vehicle off on arrival from Montenegro as a crazy thunder-storm hit Dubrovnik. The resulting traffic chaos on the streets had to be seen to be believed. Ambulances and Police Cars wailed in bumper to bumper traffic and confusion reigned. While waiting to hand-over our vehicle, an irate motorist side-swiped another parked rental. I assume this craziness was storm related frustration. Be sure to check with your accommodation about parking before booking. Off-street carparks are expensive, but become cheaper the further away they are from the city gates. Parking could be a deal-breaker when looking for accommodation. 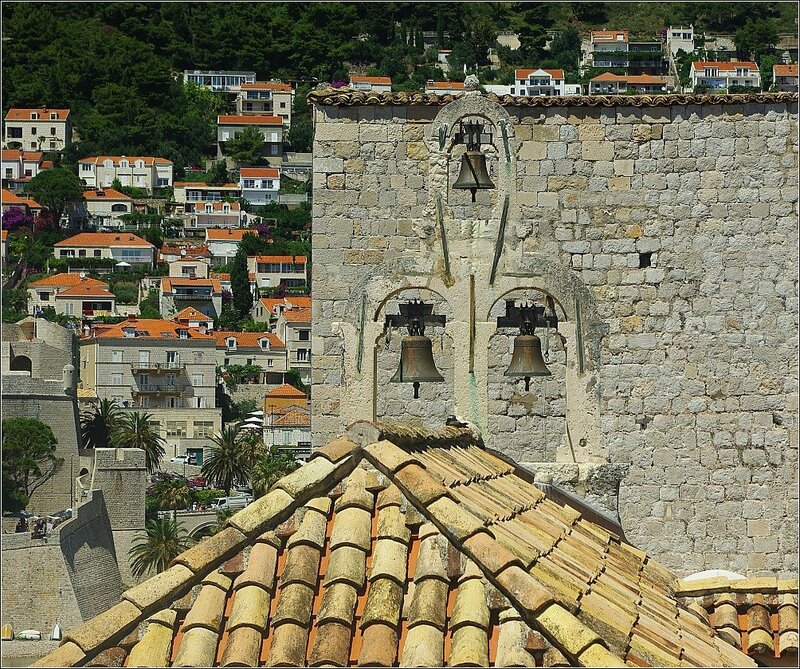 The Three Bells of St. Sebastian Church as seen from the walls of Dubrovnik. The houses in the background are outside of the walls in the Ploce neighbourhood. Outside of the walls Dubrovnik slopes steeply down to the ocean where the old city clings to a small promontory. There are a lot of steps in Dubrovnik, especially outside of the city walls. We didn’t bother doing this but if your visit is in Peak Season you might like to check this Cruise Ship Schedule by Croatia Traveller. The majority of cruise ships dock between May and October and in a worse case screnario can dump an extra 10,000 people into the tiny Grad. It is worthwhile considering planning your trip accordingly. In either case the old town empties of cruise ship passengers by 3 p.m. each day. Pile Gate Bus Depot Dubrovnik. Prices listed here are indicative only. 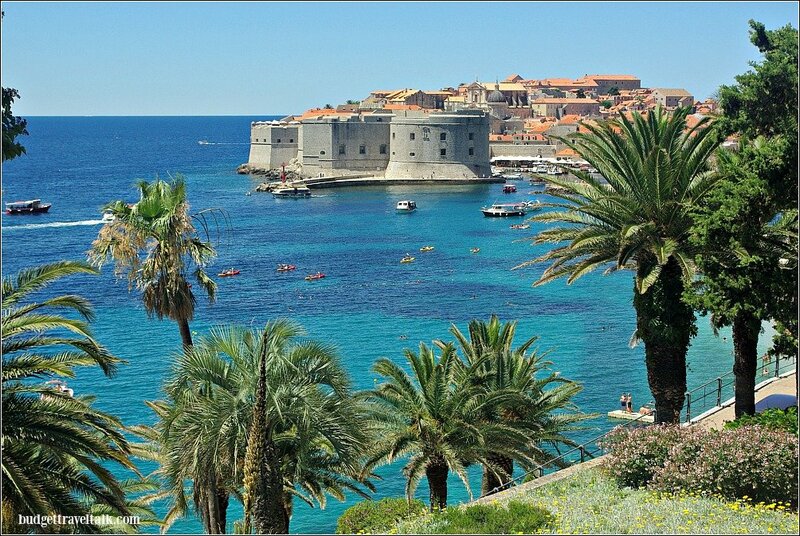 Click this link for Cost of Living Dubrovnik. Outside of the old town prices are quite affordable when shopping at local supermarkets. We stayed at Anica Guesthouse. Gruz is an affordable and pleasant place to stay. We suggest Airbnb or Booking.com. Prices are highest in July and August. Early Spring is a good time to visit Dubrovnik both for pleasant weather and cheaper accommodation prices. Bus tickets are affordable and can be purchased on-board; or (more cheaply) from Newsagents and stands; valid for 59 minutes. Just outside the Ploce Gate is a very affordable bakery. Salad roll, Croatian meat pastry and Coke Zero for $10 AUD and there is a great viewpoint nearby to eat at. 30 Kuna/Adult. Cable Car return from old town to Mt. Srd 108 kuna or free to walk. The walls provide an overview of the city and wonderful ocean views. The walk is counter-clockwise with a ticket office near Ploce and Pile Gates. Best early morning or late afternoon but check the closing time prior to purchase. 70 Kuna. The best thing to do in the old town and it is free! Game of Thrones T-Shirt = 250 kuna. Small ceramic plate with decorative fish = 6 euro. Game of Thrones merchandise can be found in dedicated outlets in the streets closer to the front sea-walls. Shops selling individually styled gifts are in the narrow lanes closer to the top of the walled city. Buza means “Hole” as in hole in the wall bar. The one we visited was called Bard Caffe Bar. Cost of Beer in Dubrovnik Karlovacko Beer (.33l) @ 0.33 kuna – expect to pay a slightly elevated price at the Buza Bar. So worth it. Driving time Dubrovnik Split is three hours minimum but is likely to be much longer. It is a scenic road with some hard to resist places to visit along the way. Sadly it is also a well-known road for motorbike accidents and when this happens traffic will be delayed. We handed our “Last Minute” car rental back in Dubrovnik having driven from Split, via Bosnia and Montenegro. We hired three vehicles from different companies in Croatia/Slovenia and “Last Minute” which we did indeed grab at the last minute in Split, was the best of them all. Their system worked effortlessly and there were no delays. They also didn’t charge extra for green card (insurance) for Bosnia which is a bit of a money-making lurk in the Balkans. 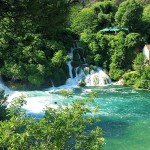 Some rental companies charge more for insurance for Bosnia when it is actually free on the green card. It is difficult to argue with insurance companies about this one, so I suggest going with a company who just doesn’t charge for it. Of course confirm this with “Last Minute” before signing in case they have changed their stance on the matter. Many people hire a vehicle in Dubrovnik to explore nearby Bosnia and Montenegro. When dropping a vehicle off in Dubrovnik be sure to get parking instructions prior to hand-over. With Last Minute Rentals we found an on-street Dubrovnik parking spot (so easy to say) and brought the representative to the car, where she arranged payment of the parking fee via the internet. The vehicle was inspected in-situ on the side of the busy road. I relate this only so that you might be forewarned and not to reflect negatively on Last Minute Rentals whose service was excellent. Last Minute Car Rental have an office in Gruz, Dubrovnik. I am not affiliated with them at all but if you’re looking to hire a car I suggest you consider them. 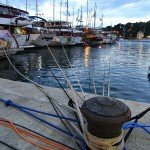 There are fast and slow ferries arriving from Split and the islands of Vis, Hvar and Korkula. They do not dock at the small port in the old town but 3km away in the Kantafig area of Gruz Bay, with bus connection to the old city. Bus tickets cost approx. 15 kuna on the bus or 12 kuna at a newsagent. The Boat Bari to Dubrovnik seems expensive, but then it is a unique way to arrive. It docks at the Cruise Port Dubrovnik. The price is dynamic so book early. Buses connect the old city with Cipili Airport 20km south-east of the City. 40 kuna one way. A taxi ride will set you back about 36 euro for 1 to 3 people. We departed to Rome via Easy Jet which was affordable and fast. Dubrovnik is well connected by air, with flights available direct to and from Istanbul, offering an easy way to jump from Turkey to Croatia. Direct flights to Dubrovnik are too many to mention individually. Here is a comprehensive list of airlines. For those flying into Zagreb, one option is bussing it to Dubrovnik, either directly or in stages down the coastline. If arriving from Montenegro there is a bus from Budva to Dubrovnik. Have you visited Dubrovnik? Did you stay within the walls of the old town? Read more Croatian posts here. Add a link to your travel post at the link up below. I am co-hosting Nancie’s Travel Photo Thursday with Ruth from Tanama Tales and Rachel from Rachel’s Ruminations. Loved this look at Dubrovnik. Hadn’t thought about traffic jams there, although it does make sense for as popular as the old city is, as we always have visited as ports-of-call on a cruise ship and simply had the shuttle drop us off near the walled city and then we’ve walked back to the ship. Most interesting and filled with useful tips! Yes Jackie, the traffic was quite traumatic when we were there, but you really don’t need a car for Dubrovnik, unless you want to go elsewhere and use Dubrovnik as a base – I can think of better bases though! Gorgeous! Another place to add to the list. Yes Dubrovnik is a worthy destination to be on everyone’s list Anabel! You were in the Ploce neighbourhood – a nice place to be Sally. I like the idea of watching the city come to life from a cafe! I’ve enjoyed my visit to Dubrovnik and again wish I lived closer to Europe – not that I would ever trade Australia as home! We would love to visit Europe again one day, and Dubrovnik looks like a wonderful destination. Thanks for this insight. I really enjoyed reading and seeing your pics. Happy travels. Thanks Jill, I’ve enjoyed sharing them. Wouldn’t it be great if we could just pop over to Europe for the week-end. I am one of those that like to book accommodations as I go but I think that would not work on a lot of places in Europe. When I went to Spain, I booked ahead and got good prices. And, thank God I booked because I found out I was going to be there during a holiday weekend. There were hundreds of families looking for a place to stay. For accommodations in San Sebastian I waited till the last moment (because I wasn’t sure how long we were going to stay) and had a bit of a problems finding a place at a good rate. Yes those local public holidays have caught us out when we haven’t booked in advance! When I think about this part of the world I don’t picture beaches in my head but wow! They’re beautiful. There’s something magical and entrancing about a walled city. Outstanding summary, Jan.
Jan, We didn’t stay in Dubrovnik long when we visited Croatia, because I did find it more expensive and more crowded than other places. However, it is a gorgeous city and well worth staying there for a few days. Great tips! Yes Corinne, Being one of Croatia’s top destinations it is definitely very crowded. After the ships passengers are out of the equation it is somewhat better. At the end of June it wasn’t too bad. Living outside the walls probably had a bearing on that too. I always love seeing your photos, and I think I’m going to plan Dubrovnik into my next few years of travel … somehow! But it sounds like off-season, in the spring or fall, would be much more pleasant and cheaper. We were there in late Spring and it was lovely, but I think autumn would be good too. Besides the crowds I think that Summer would be far too hot in the walled city. It is all stone and it would radiate the heat. 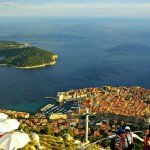 I really would like to visit Dubrovnik someday, and your post just reinforces what I’ve heard recommending it. I think I like the photos of the cloisters and the 3 bells the best. Thanks for all the tips about the carhire and the parking as I don’t know that I would have thought to think about issues like where to park. They are two of my favourite photos too Michele. 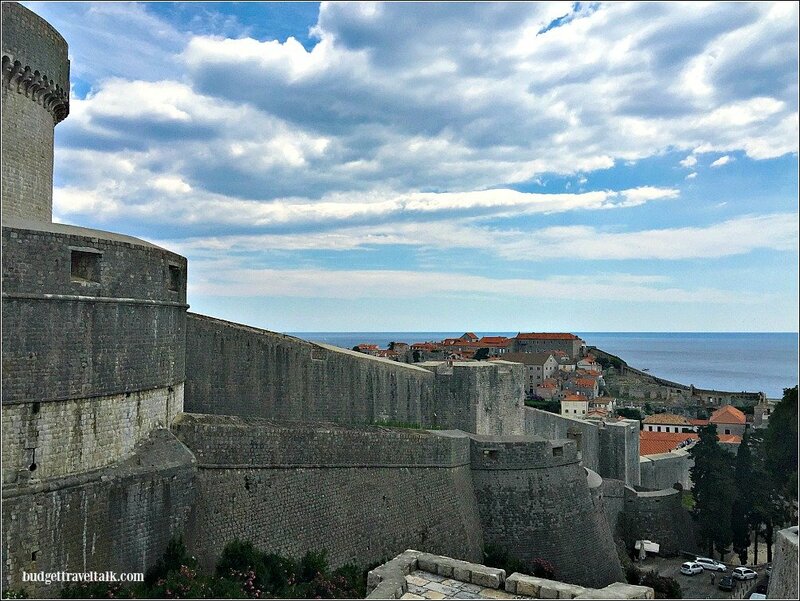 wow what amazing photos and tips for staying at Dubrovnik – the drivers sound crazy over there!!! I think it was the crazy storm that made everything chaotic. Absolutely gorgeous pics Jan, and some very good advice. You’re right, it’s hard to know if it will be too busy in the walled city when you feel that’s what brought you there in the first place. We stayed at a hotel on the oceanfront, but your little guest house looks sublime. Was your hotel near Banje Beach Jo, because that is a gorgeous area! 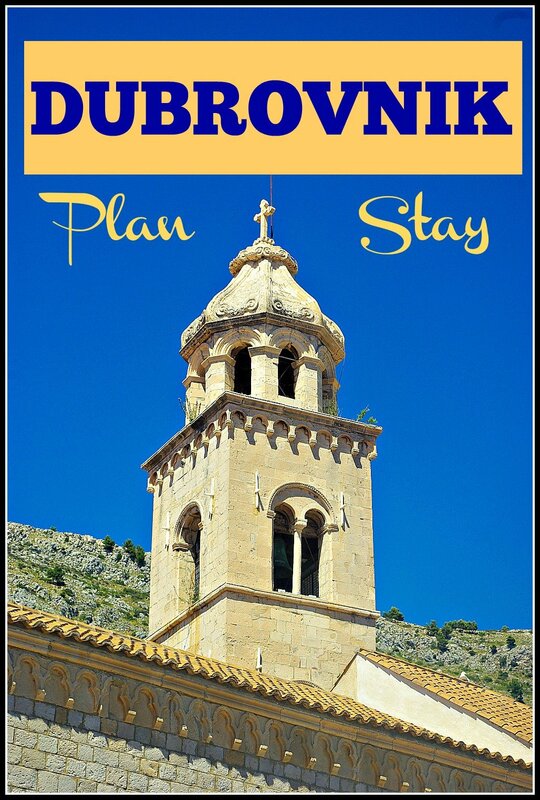 These tips on Dubrovnik will definitely come in handy when I visit next year. Your photos are exquisite! Thanks Kathy, the best of these photos were taken on Marty’s Camera. When the sun shines Dubvronik is picture post card perfect. Views from the walls are of orange roofs, stone walls and houses with a back drop of drop dead gorgeous Adriatic blue. 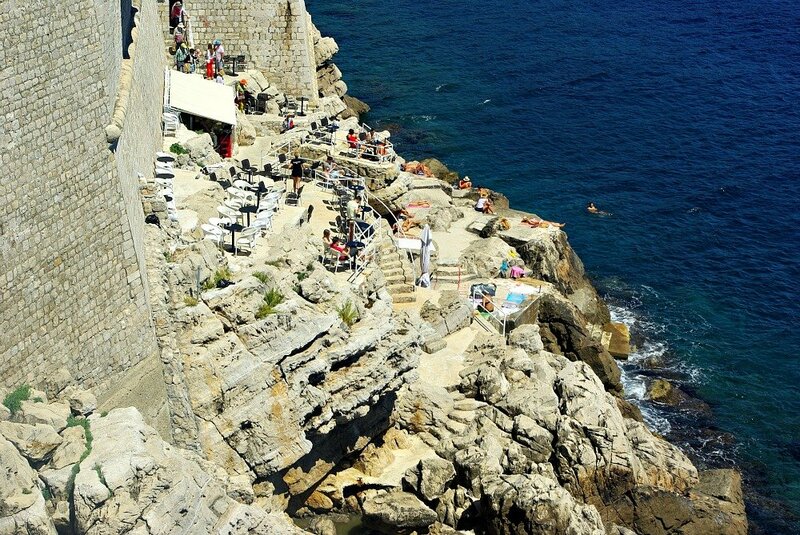 Wouldn’t it be great f we could pop back to Dubrovnik for the weekend!…Oh to live in Europe! Your fabulous photos have bought back great memories of our stay there a couple of years ago. We stayed in an apartment just near the Mount Srd Cable car station which was very handy and not too many stairs to worry about! One of the places I’d bookmarked was in that area! Think of the money we would save flying back and forth if we lived over there. We certainly are isolated down here. Loved this post – it had so much useful information that I had to pin it for later. Not being a fan of crowds, it’s nice to know how to avoid them by visiting late in the day or during the winter months. I’d not thought about the parking issue, but it stands to reason because walled cities weren’t built for cars, lol. That’s one more reason (besides price) to stay on the outskirts.